Yeah, but: It's a review with a surprise ending. The Long Version: Sometimes I'll like something so much that I'll go out and buy something different. It sounds odd, but that's what happened when I started thinking about my Spyderco Native and the potential that it would have with a plain edge. I love the Native's blade shape, but life's too short (and funds are too limited) to keep re-buying the same things. So instead I picked up an unserrated Spyderco Caly3. The Japan-made Caly3, née Calypso, has a cutting edge that's almost exactly the same as the Native. The profile of the back of the blade is slightly different, but where the two completely depart company is the handle/blade junction and the choil. The Native is like a typical knife, with the top of the blade aligned with the top of the handle, while the Caly is like a typical Spyderco knife with a pronounced curve that houses its opening hole. That combines with a modest choil to make a knife that's great to hold by the handle but not very easy to hold by the blade. 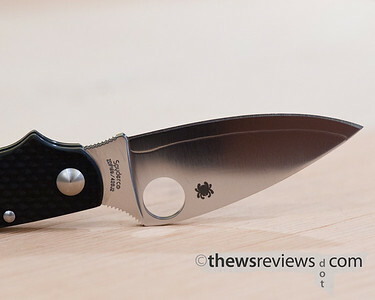 Spyderco has been doing some interesting things since I bought my first-generation Native, and the Caly3 showcases a lot of different materials. The liner within the handle is steel that has been drilled out for lightness combined with a carbon-fiber shell, melding the technologies that went into racing bicycles in the `70's and today. The blade is the ridiculously high-carbon ZDP189 steel that's laminated between two softer 420J2 steel layers, simultaneously optimizing it for the contradictory goals of high sharpness and low maintenance. The result is a visible and tactile line between the materials, which isn't the prettiest, but it's worth it. The Caly 3 is an incredibly sharp knife, in fact simply carrying a photograph of it is enough to accomplish many common cutting tasks. The blade has a flat grind – a continuous taper toward the sharpened egde, like a kitchen knife – which makes for an excellent cutting blade. Remember that once the sharpened edge is through the material, the rest of the knife just becomes a wedge, and sturdy blades with a steep grind can be like trying to cut with a doorstopper. If carrying a knife with the intention of hurting someone seems like a solution instead of a problem, then you have some fundamental life-choice issues that a weapon isn't going to resolve. The compromise with a thin flat-ground blade is that a narrow wedge is weaker than a steeper one, but with modern steels and light-duty knives this seems to be less of an issue. After a month of use the tip on my ZDP189 Calypso is still as perfectly pointed as it was when it was brand new. I still wouldn't suggest using the Caly to split firewood, but that's a bad idea for hunting knives too. The cutting power of the laminated steel Caly is awesome; I've never used anything like it. I recently needed to cut through some hard plastic, and my first thought was to try to find metal shears. Realizing that I don't own any, my next move was to grab the Calypso, and it had no problem with the job. None of my other knives have the edge sharpness or the low-profile blade that made the cuts so easy. I do still prefer the overall feel and handle design of the Native, so my Caly isn't about to retire it completely, but it's great to have options to suit my different moods. 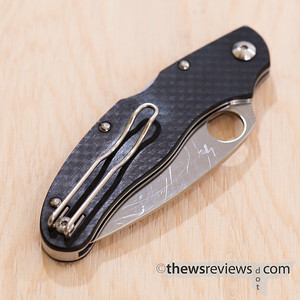 The Caly 3 is my first encounter with Spyderco's wire pocket clip; I've heard it called a "paper clip" and now can't think of it any other way. It's carries the knife much lower than the sheet-metal design, and I've had to re-learn how to take the knife out of my pocket. With the Native, and all of my other knives, I can grasp the end between my thumb and the first knuckle of my index finger, with the Caly I need to loop my finger down around the bottom of the wire clip and use it to pull the knife out. 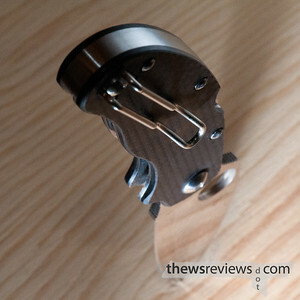 The new clip style holds the knife very securely, just like the old one did. The opening action with the Caly isn't the smoothest, partly because of its metal-on-metal construction and partly because of the locking mechanism. The blade also scratches very easily, so while it starts off as a knife with selective aesthetics, it also doesn't really improve with age. Neither is an issue for a working tool; they make the knife slightly less pleasant to play with, but don't diminish its usability or cutting performance. But after buying and reviewing two broadly similar knives, I'm not really in a position to strongly recommend either one over the other. The classic Native and the latest Caly models are both great, but it gets even better. Rumour has it that Spyderco is making a new model of the Native that updates its blade to the laminated steel and flat grind of the Caly3. The blade-handle junction of the Caly is best for people who primarily hold the knife by the handle, while the Native is better for people who like to choke up and hold it by the blade for fine work. Beyond that distinction it's hard to go wrong with either one – there just aren't any bad choices. Personally, I'm hoping that it will be a couple of years before I buy another knife, but you never know.